You know the blogs and forwards and Advent Conspiracy and It’s Not Your Birthday and even the OccupyAdvent on twitter have a clear message that Advent is not a time for commercialism or just giving ourselves a bunch of stuff that we really don’t need when we’re blessed with so much? I have enjoyed reading them and trying to stay present and mindful during Advent. I also appreciate the counter-cultural. Isn’t that what we as the Church are supposed to be? The hilarity that has ensued has nothing to do with whether I believe in these practices or not and nothing to do with whether I think we could really solve basic problems in the world just by sharing and giving what we can to those in need. Because I do believe that. I honestly believe that if we saw past our own needs and our own selves, than we wouldn’t just want to give, but we would be compelled to give – it would be a moral, spiritual and imperative obligation. So here I am trying to teach that to my children – who just turned 3 and 4 by the way – and lo and behold, it’s not as easy as it may seem. At least not in our house. I recently posted a blog to my facebook that I loved….. I love that it wasn’t something parents imposed but was the kid’s idea. I also love that it was a family affair and something everyone enjoyed and got into. I had been keeping the Heifer International catalogue on the counter in my “put everything in it because you don’t want to lose things even though it’s a jumbled up mess” basket and I thought this may be the time. Evy had gone to sleep early so it was just me and Enoch, the 4 year old. So we started talking about Jesus and Santa which good golly it’s easy for me to distinguish between the two (duh!) but explaining to a child the differences is hilarious. And then we started talking about gifts. The first hiccup was that Enoch didn’t understand why everyone didn’t get gifts. If we say that Santa gives gifts to good little boys and girls than why didn’t some good little girls and boys get gifts? If we see that Jesus loves everyone and came here to be with all of us, why doesn’t everyone get gifts? Why are there poor people? Why do they not have money? What do their Mommy’s and Daddy’s do? We then started talking about toys. I frequently tell Enoch that I think he has more toys than Toys R Us and that he needs to share them. We’ve talked about this in making Operation Christmas Child boxes and using his happy meal toys for this and other small toys. So I tell him that he’s still going to get toys from Santa but that we as a family can give animals to other families and communities. Oh boy. Let’s just say that when we opened the catalogue and he had the option to pick out goats or bunnies or baby chicks or cows, he wanted them all. Not for the other families, but for him. Especially the baby chicks. Mike got a good chuckle from this entire interchange, nut needless to say, I talked about people that don’t have enough foods and how animals can help give us food or we can sell things from the animals so that we can take care of each other, etc., etc., etc. The amazing folks that we stay with on our trips to Nicaragua have asked us to bring the kids with us on our trips, and I’ve never more than that night wanted to take them on one. Because I can explain and explain and explain and we can make our Operation Christmas Child boxes and we can pick out our baby chicks, but there’s nothing like seeing and interacting and playing with children that live in such very different conditions than your own. So that was my first thought. I want Enoch and Evy not to give just because it’s right or just for the joy of giving – even though those are good, but I want them to understand and see and know and feel that passion about providing for the least of these – not just as a hand out or looking down on people or we as the great Western world, come to save them – but knowing that this is what we’re called to do. Josh preached a sermon series on stewardship a couple weeks ago and I think about his Spiderman illustration of the saying that many of us know – “With great power comes great responsibility” or the words from Luke 12:48 – “To whom much is given, much is required.” We have been given so much. When I started preaching in a local church I had no idea what to say when handing out the offering plates and so I started to say, “May we give back to God what God has graciously given to each of us.” It’s God’s. And we have been blessed. But it’s hard to see and know and feel our blessings sometimes if we don’t see what would have happened without them. I don’t think that’s always the case, but Enoch doesn’t know how much to appreciate that Optimus Prime transformer when he has a toy box full of toys versus if that was his only toy. The other thing that jumped out to me is the nature of us and commercials and books and songs and how we talk about Santa Claus. When we’re talking to children about Santa, we talk about Santa giving gifts to little boys and girls all over the world. We talk about the good children getting lots of present and the bad children getting coals and switches. So if you get a lot of toys, you’re a good kid? If you don’t, you’re not? I remember the Christmas that my dad gave us walnuts and oranges in our stockings because that’s what they had done when he was a kid. Not hating on the walnuts and oranges, but we wanted chocolate and candy canes and little toys – not just some walnuts and oranges. I’m not the parent that talks a great deal about Santa or the ins and outs of how he gets everywhere and how many gifts he gives, etc. but there’s no way I can honestly say that I haven’t used Santa during the holidays. He’s the best leverage in the world in December when kids are wild on Christmas party, candy, and just the excitement and fun of Christmas in the air! We haven’t bought an Elf on the Shelf, but even I can throw out there – Santa doesn’t like whiners or people that don’t share with their sisters and brothers or those that say potty words (Enoch and Evy’s potty words of choice right now are “diaper” and “baby” so watch out if you’re called a “diaper baby.”). I can throw that out there with Jesus all year long – Jesus likes you to share, Jesus wants us to love even the bullies, Jesus….wants us to give a family some baby chicks instead of you getting even more toys. I don’t have any answers with this blog, but I do think it’s an interesting commentary on how we talk about Christmas and how we see it. It’s been fascinating trying to talk to Enoch and Evy about this. They understand the manger and the Christmas story and they understand Santa and giving gifts but how those two relate…we’re still working on that one. To be honest, in thinking about it, I’m still working on explaining that one. These are the things that I love about this age. 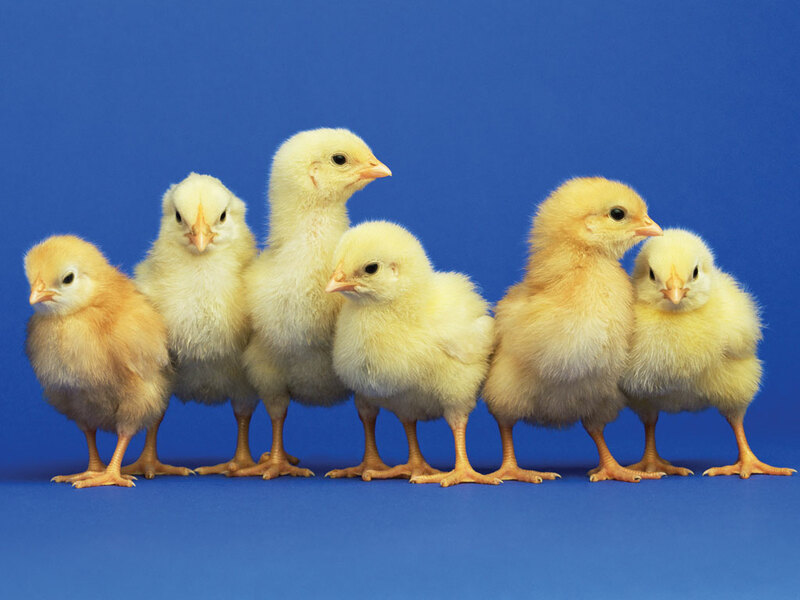 They’re honest and they don’t know all the “right” answers yet….they just know that they’d like some baby chicks. How are we preparing during Advent? How are we not just posting the articles or getting the tweets, but we’re actually engaging in what it means to wrestle with these counter-cultural ideas? Explaining to a 4 year old, how are we showing the amazing Christmas story and the essentials without getting all bogged down in Santa? ***Note that I’m not saying not to do alternative gift giving – quite the contrary. I think we really should! I just think it’s important to communicate the whys and the whats and the Whos and not just do it for the kudos or the gold stars! There are a gazillion great orgs to give to!!! Our sweet precious rambunctious and wild children went back to preschool today and many prayers and blessings on the Episcopal Day School! They have done wonders for our children and we appreciate them so much – especially this time of year when we are more than excited that the kids are back in school! I got to spend a “Mommy Day” with the kids on Tuesday and we cleaned up and sorted their rooms and moved toys from downstairs and upstairs and got things ready for school. Then we closed out the afternoon driving to Columbia to go to the zoo and see Grammy and MacMac. It was an amazing day! I wish we could do that every day although I realize going to the zoo and cleaning up everything can’t happen every day – but you get my drift. It was a great day also because the day before a wonderful clergy colleague of mine posted to facebook the question about what other clergy couples do about childcare on Sunday mornings and Wednesday nights? It’s a good question and it seemed to strike a chord with a lot of folks. It’s hard. Many talked about awesome and wonderful people in congregations that help out, give snacks, and offer grace. Many also talked about how hard it is to be both Mommy or Daddy or Parent and Pastor at the same time. For me although I love for my kids to be at Wesley and I love for my Wesley students to be at my home, I love it because there’s no set “thing” that I have to do. If I’m preaching or leading a small group or having a board meeting or there’s some reason for me to suddenly turn into Pastor with my cape and everything, it’s hard for me to balance those two sides of my brain. When the kids were really young they did come with me to Wesley, and they do now sometimes during the day when Mike has meetings and the students are just in and out and there’s no set program. And it is obvious when they have been here – finger paint on the coffee table, game pieces everywhere, the candy basket decimated. 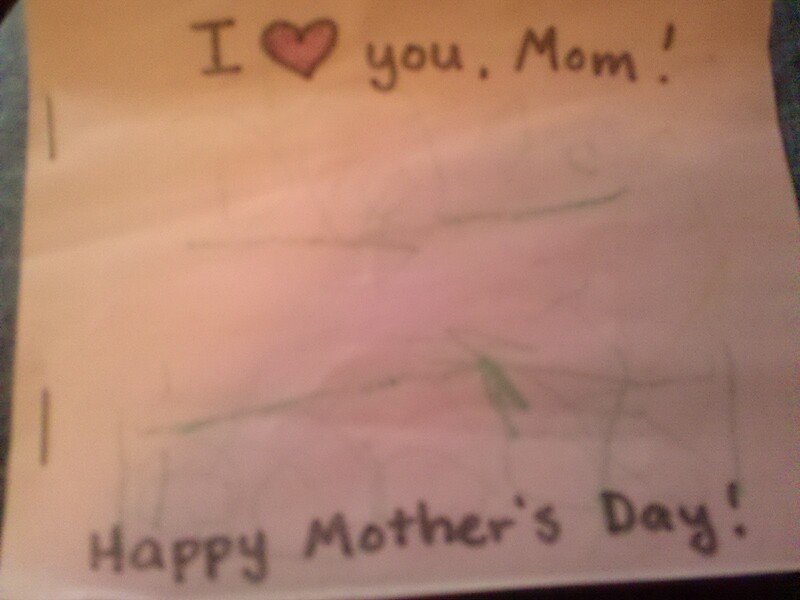 I love being their mom and as Mike said to me the other day, they know that I love them. I never understood my grandmother telling us that “she could eat us up with a spoon.” (Oh Southern colloquialisms) But I love them that much! Not really literally of course but adorably. And I love being a campus minister. I really do love it. Not just kidding, but seriously choosing to do this and feeling called to do it. The rub comes when those worlds collide and I feel guilty for ditching out on the Freshman Small Group because I want to put the kids to bed or my mind is elsewhere because I’ve been up all night with a sick child and I can’t really be present with that student over breakfast at all in my right mind. Or the opposite – when I wonder what in the world my kids think about this whole Jesus thing or if they’re going to think of “church” or “work” as bad words because that’s what takes Mommy away. It’s such a tension between the two. And I’m not even going to mention when you need time to not be Mommy or Pastor – because that’s a whole different ball game. So what do y’all do to keep balance? What are some working mom tips? Or ministry mom tips? Or you know, sometimes it’s not even tips, but it’s just that we’re not alone out there trying to juggle. I’m not talking about “Don’t Know How She Does It” with Sarah Jessica Parker because who knows how that will turn out, but how do we feel good about being both Parent and Working Person and okay with the sacrifices and compromises made both ways? Enoch’s funniest thing about God lately is his very serious questions about Jesus in his heart and how can a person be in his heart and did he shrink and is he just hanging out in there and is he going to get hurt squished in there? Priceless. Okay, so I’m terrible at telling my kids about Jesus. Yes, this is confession time. Yes we have books about Jesus. We have bought tons of books from the Christian bookstore. We’ve tried to get the kids to watch Veggie Tales and I’m thankful that 3-2-1 Penguins usually throws in some Bible verses and prayer. We say our prayers before the kids go to sleep. 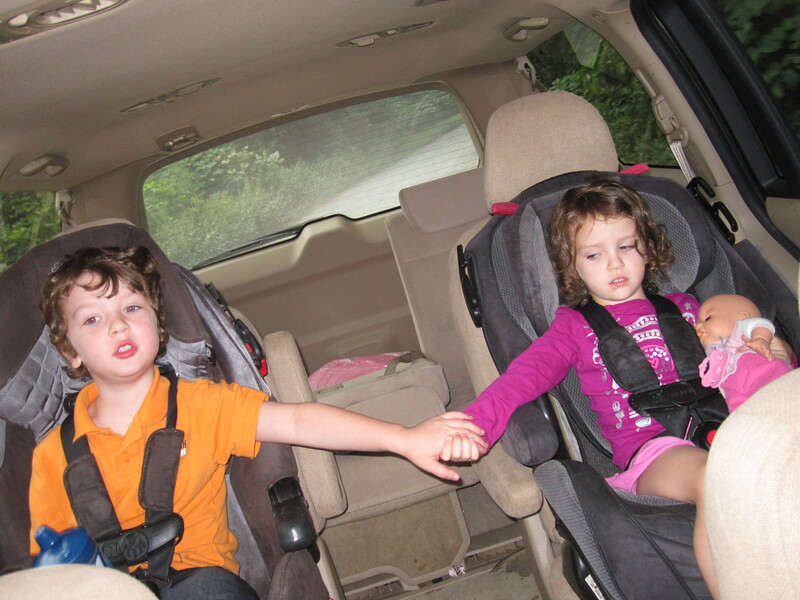 Slight caveat – when we’re not completely exhausted and just trying to survive and get them to actually go to sleep. We do say prayers when we sit down to eat although not so good if we’re in the car eating a happy meal. You get the drift. It’s weird that something that is a big portion of my life and significant portion of Mike’s and the rest of the families – is not something that I know how to communicate to two little people. I’m starting to think that the kids during children’s sermons are humoring me and actually have no idea what I’m talking about half the time, or like I think – they’re just super smart. So I’ve been trying to do better. I’ve been asking Enoch about Jesus or what he knows about Jesus. He immediately said Father Voss talks about Jesus. Thank you again Episcopal Day School for coming through for me! Enoch is now wanting us to tell him stories when he goes to bed. And of course, he wants super heroes and Iron Man. So last night I’m telling him about super heroes like Iron Man and Spider Man and Batman and the greatest, most powerful super hero of all – Jesus. Could be kind of lame, I know. And then he interrupts my story because he wants to know about the bad guys. He is always curious about the bad guys. Where do the bad guys live? What do they do? He even asked about their mommies and daddies. So then I start telling him about the bad guys and I’m going down this path like not all bad guys are really bad. Some of them want to be good, but they’re misunderstood. You know – misunderstood – is not something I think Enoch gets. So hear I am, this preacher who was an English major and I am struggling and I do mean struggling to tell this Super Hero Jesus story and give some exposition about the bad guys and use words that he would understand in his tired, just turned four year old state, and wowzers. That is hard. I came downstairs after Enoch fell asleep listening to my story. (Of course my awesome story was not related to him falling asleep, that was just a coincidence.) And I’m talking to Mike about telling Enoch about Jesus and I’m like, if only there was a cool cartoon. An awesome very kid-friendly cartoon with Super Jesus. But then I thought, well that would be potentially very cool but also could be very weird and not well done. Although the healings and the teachings and the letting the children come to him would work well, I don’t know how the crucifixion would play. And what would Jesus look like? Our blond haired blue eyed Jesus or the for real Middle Eastern Jesus? My mom has been looking a lot at children’s Bibles and Bible story books about Jesus’ life and she says it’s hard to find them now showing a picture of the cross. Most seem to go straight from healing and teaching to Easter without any in between. She was saying that it’s hard to tell the story in a way that makes sense when you start with a baby and end at Easter with nothing in between. A baby that’s born in a stable and then grows up and comes back to life. There’s so much more to it. The teaching – the love, the sharing, the care for those that are sick, or as I was saying last night the one who is kind to people that aren’t feeling well, who are sad, who are scared, who need a hug. Part of me thinks – no worries – when he gets bigger we’ll take him on mission trips, we’ll show him the joy of giving his clothes and toys away to people who need them, we’ll teach him how to share and be kind and honest with people. It will be a lot easier to explain this stuff to him then. But there is a foundation being built now in the world view of a child that separates the world into super heroes and bad guys. We haven’t even gotten into the bad guy turned super hero or super hero turned bad guy. It’s just funny to think about and ponder. With as much Christian marketing and advertising and everything under the sun Jesus-related from mints to bracelets to shoelaces to action figures, you would think that it would be easier to explain something so all over the place. So, I’ll be continuing to figure out how to tell a child about Jesus. I know some of you have that down pat and if any of you are in the Rock Hill area and want to take Enoch and Evy to lunch or to the park to tell them, let me know. I trust that we’ll figure it out. I trust that they’ll one day get it. And I trust that in my trying to ineptly explain this to them, I’ll learn a heck of a lot too. In thinking about how I learned about Jesus – I think about VBS and Sunday School and singing in children’s choirs. One of the songs that I clearly remember is this one. It is so in my head now. AAAHHH!!!! Yesterday Enoch got in trouble at school. When you have a child as boisterous as ours you’re not entirely surprised by this, but you may think to yourself, okay – we’re due for one of those. However, it’s never fun as a parent to hear that your kid got in trouble. Everywhere we go and Enoch sees someone from his class, he’s not always great about remembering and saying everyone’s names, but they all seem to know his name. I’d like to think it’s because he’s wonderful, but wonder if it’s because they hear his name called a lot. Hopefully a little of both. Anyway, Enoch got in trouble because he wasn’t listening and following directions. I am always eternally grateful for the Episcopal Day School here in Rock Hill and all of the many ways they have worked with our kids and support them. I can’t say enough what a great job they all do there! I also cannot say enough how much I appreciate that Mike works while the kids are in pre-school and than has the opportunity to be with them in the afternoons. I know that everyone doesn’t have these choices and opportunities and they are a gift. Mondays are Mommy Day when the kids get home from school because Mike teaches piano and guitar lessons and then has practice with the worship team at St. John’s. As much as I don’t always like to drag myself away from work and trying to make a dent in the to do list, I really enjoy Mondays and look forward to being able to tell the kids, you’ll get to see and spend time with Mommy this afternoon and evening. We usually have a great time. And we did at times yesterday. But there were also a lot of times I wanted to scream and say I’ve had it. That whole listening and following directions thing – yep, it’s for real. In putting in time out after time out whether at home, in the car, or at the park, we talked over and over about listening and following directions. Over and over after he stayed in time out, he would agree to start listening and following directions, and over and over when he didn’t want to listen and follow directions, he wouldn’t. Oh the cycle of parenting. It got me thinking a lot though. We keep talking about listening and following directions together. It’s one thing to not listen and it’s another thing to not follow directions but it’s also a bit of both. We all know about selective hearing. I know that if I reach a certain decibal or tone than maybe he’ll turn around and stop, but before I get there he may not be paying a hill of beans of attention to me. Oh to have the child that immediately stops and listens and follows directions. My mom has frequently classified Enoch as the strong-willed child, and I promise his picture should be in the books describing it. But again, as I’m thinking this yesterday and typing it today – I can’t say that it’s not something the rest of us don’t do at times. 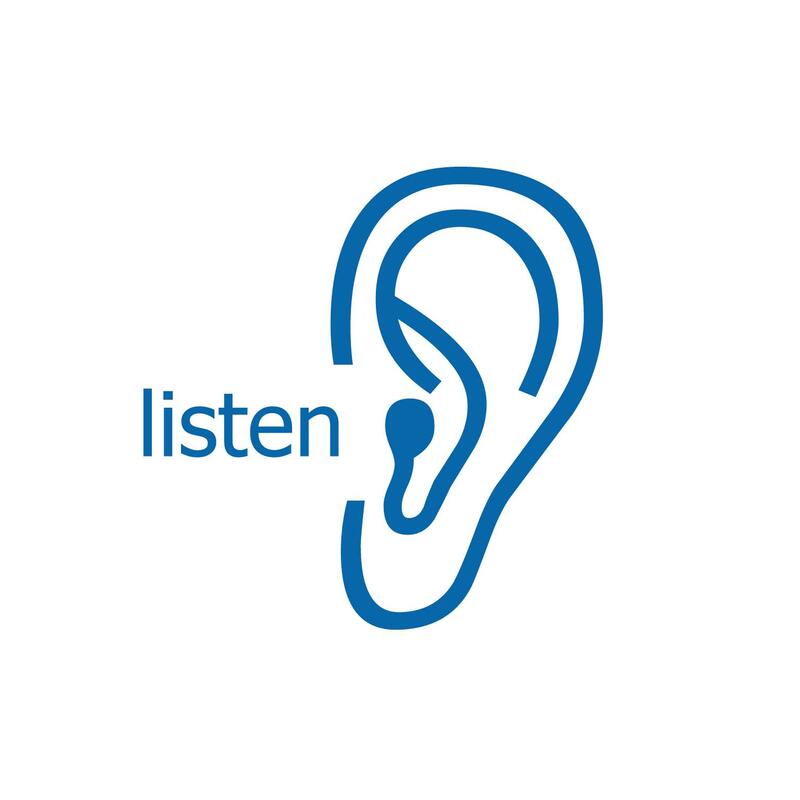 We selectively listen for the things that we want to or don’t want to follow. We don’t have the discipline to always listen to those that might know more than us or to the Creator who actually for real knows better than us. Were you the child that immediately stopped and listened and followed directions or were you the child that questioned authority and wondered if it really was as threatening as they said it or if this was really serious or not? Listening and following directions for a child is a great deal about safety and what’s best for you and trusting that your parents are telling you what’s best for you. But isn’t it the same way with us and God? Do we listen and follow directions? Do we read the scriptures or dig down in our faith and engage with texts on justice and mercy and kindness and love? 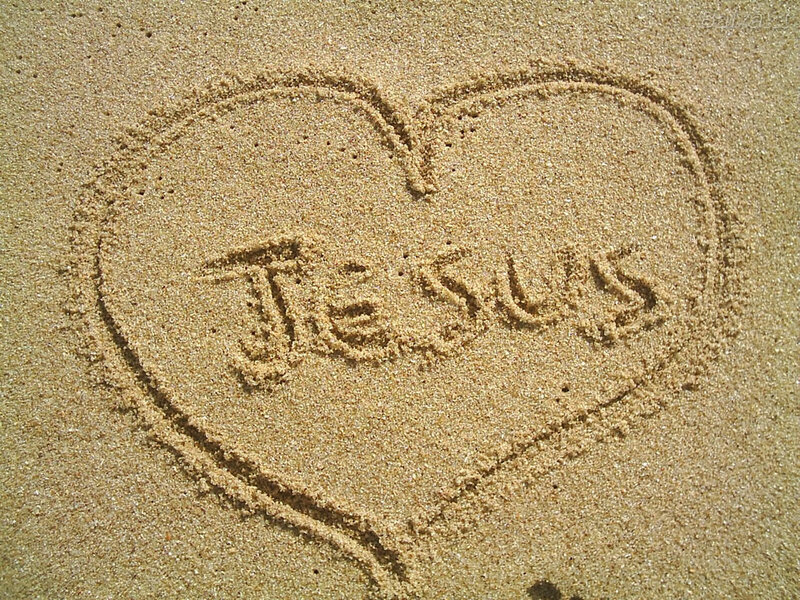 Do we follow the directions of love God and love neighbor or do justly, love mercy, walk humbly with God? Are we really hearing it or are we hearing it when we want to and it fits and it still allows us to do what we want to do? Move over, Enoch. There may be some more strong-willed children out there. Heck, I think the Bible and our pews and our grocery stores and all around us – we may be chock full of them. As we try to teach Enoch about listening and following directions, there’s a lot of time outs and boundaries and loss of privileges. How does God get our attention about listening and following directions? Does God use our full name at the top of God’s voice? Does God shoot a message across the sky saying hello – take the call dude? 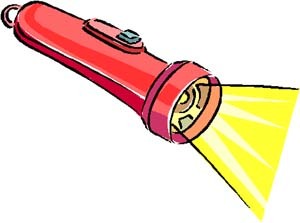 Are we plowing so full steam ahead in whatever we think we’re supposed to be pursuing that it’s going to take something radical to derail us and make us re-evaluate? I don’t know. When I think of a loving Parent, I don’t think of someone that just lets us get our way all the time or do what we want to if it’s harmful to us. I think of One who is patient and fair and consistent. I think of one who corrects and is present and who is there to make sure the consequences are real but who is ready for a hug and to wipe away a tear and offer words of encouragement and a new opportunity. How do you do at listening and following directions? How has God our parent shaped and molded us? Enoch and Evy go to an amazing preschool and we love it! It’s the Episcopal Day School (EDS) here in Rock Hill. We have had a wonderful experience there and I know that our kids are benefiting a lot from being there. For Mother’s Day, Enoch’s class made mother’s day cards where they drew little pictures and answered questions from the teachers. He’s actually in two different classes, a Tuesday/Thursday class and a Monday/Wednesday/Friday class. Loves them both! In his Tuesday/Thursday class when he was asked the question, “I know my mom loves me because…,” he answered, “She holds me when I’m sick.” He had been sick then with strep and a virus and so that was really sweet. For his Monday/Wednesday/Friday class he answered in a way that Mike says is absolutely priceless. 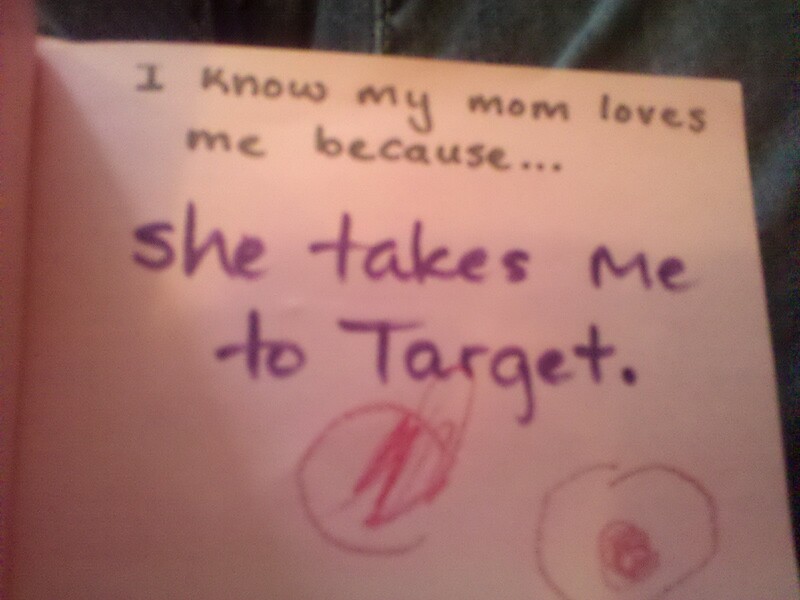 I know my mom loves me because…She takes me to Target. She takes me to Target! Should I be appalled? mortified? amused? At least he knows that I love him. True. But do I want him to know that I love him based on me buying him toys at his favorite store on earth? Yes, it is a regular question at our house – can we go to Target today? Both children love the place. Heck, I love the place. I may be rubbing off on them in not so good ways. 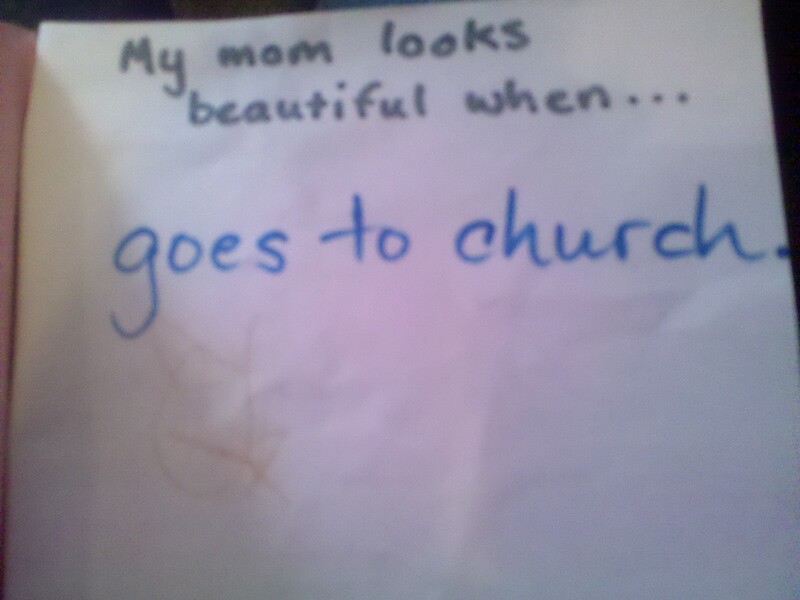 One of the other questions was, “My mom looks beautiful when…” And that very wise little one put “she goes to church.” Can’t decide entirely how I feel about this one either, except that he’s an observant little rascal. There are many days during the week where I admit to skipping the shower in order to get more sleep, get the kids ready, or run around the house picking things up. However, on Sundays, I actually try to make some effort and dress half-way decent, not in my campus minister uniform of jeans and no make up unless I have a meeting. There’s something about the honesty of a child that is just priceless. It gives something to think about in new ways because it’s something that’s not coached or said through the filter of trying to hurt our feelings or not. What do our children remember about us? What do they think our priorities are? In the eyes of a child, who are we? Those lenses tell us much about where our hearts really are and I think what we would find would both make us laugh and cringe and nod our heads and be stumped all at the same time.